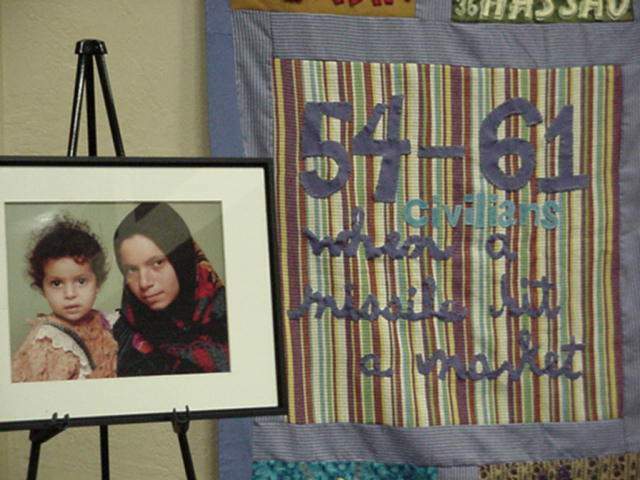 On March 22 and 23, the American Friends Service Committee's traveling exhibit, "Eyes Wide Open" came to Fresno. Stated quite simply, it is the most powerful exhibit in the US today. Why? Because it causes us to start thinking and feeling the human cost of the war. Normally, the display includes over 1500 pairs of combat boots representing each American soldier killed in Iraq set out on the ground. 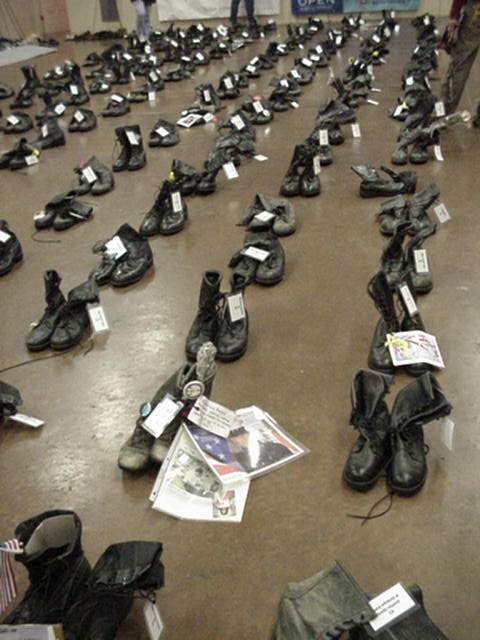 Many of these boots have been donated by the families of the dead soldiers, often with a memento or pictures of their loved ones. Each pair has the name of the soldier it represents tagged on it, save for a few where the parents wished to withhold their permission. Another 1,000 pairs of civilian shoes represent the 10,000 to 100,000+ Iraqi civilians who have been killed. In addition, there are panels with the names and ages of the known Iraqi civilian dead... thousands and thousands of names... many of them children who had never even heard of Saddam Hussein of George Bush. Displays also about the financial side of the war; about the way our military budget dwarfs our expenditures for education, health care, or public safety. Many Americans don't even know that this war is being fought totally on BORROWED money, 300 billion so far, which will have to be paid back some day. China and Japan alone own 40% of this debt. We have become the world's leading debtor nation. That has to do with only the nuts and bolts of the war. The human cost is something else. The night we went to the Eyes Wide Open exhibit, it was pouring rain, so it was held in a church auditorium rather than in the park where it was slated to be. 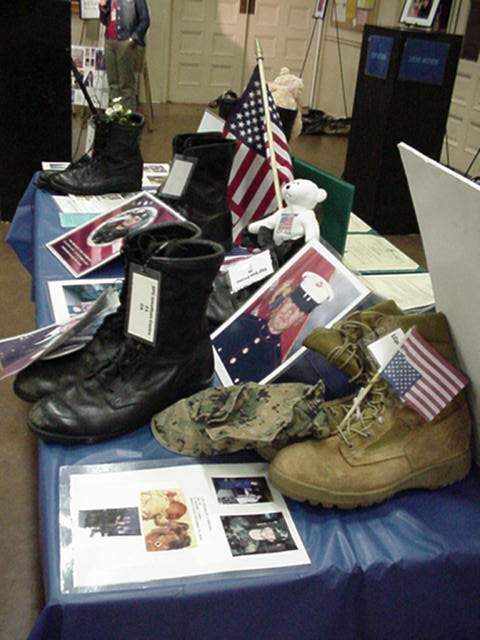 Consequently, only 200 or so pairs of combat boots could be exhibited, just the soldiers from California who have died. That does not sound like much... nor does it look like much in a tiny photo. But to be there was to be in a room filled with ghosts...our troops and the Iraqi dead. It was on a very personal level, and a profoundly moving experience. It did not take much imagination to see all of the young men standing there in their footgear and wonder if they knew why they died. To see the tiny shoes of children was even harder, as they were killed playing in their own back yards in a war in which they played no part. Our government has tried to sanitized this war by not allowing the media to show the flag-draped coffins of our dead being brought back to America. All flights carrying the dead and wounded are unloaded in the middle of the night. From the point of view of the political leaders who took us into this conflict, the less we think about it, the better. Is that honoring the dead? A cross in the Arlington Cemetery or a name carved into marble are not the same as being surrounded by the empty boots. I called this exhibit dangerous, and so it is. By making you feel closer to those who were sacrificed, the less likely you will be to blindly support the war. You feel a kinship with the dead, and the human cost of the whole thing comes home to you. Washington does not want people to think about the costs of the war, either financial or human. The true reasons for the war, we now know, have nothing to do with the reasons our leaders have given us. 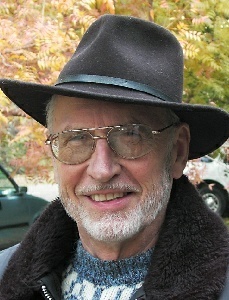 The fantasy WMD's, the giving of "freedom" to a people who did not invite us to do so, the nonexistent connection between Iraq and the Saudi terrorists that were responsible for the 9-11 disaster, the faked connection between the African nuclear material and the Iraqi nuclear establishment have all made Americans begin to wonder. Even the ruse of hiding the cost of the war by not including it in our national budget is not playing well in Des Moines. We have sacrificed our moral position in the world, mortgaged the future of our grandchildren, caused the brutal deaths and maiming of countless thousands of human beings like ourselves, and created a new generation of America-hating terrorists. Whatever the sidebars to the story of our battle to control the Middle East, the bottom line is still oil. Important as this may be to maintaining our 15 MPG American Way of Life, I suspect many Americans would not have wanted their son or daughter to march off and kill for it. One can only hope that the ghosts of the dead represented by the boots and the shoes in the Eyes Wide Open Exhibit help us to open our eyes to what we are doing to the world and to ourselves, and point out the uphill path that leads to compassion, justice, and a lasting peace.